Interfraternity Council president Will Altabef, a Communication junior, answers questions during a forum Monday evening. 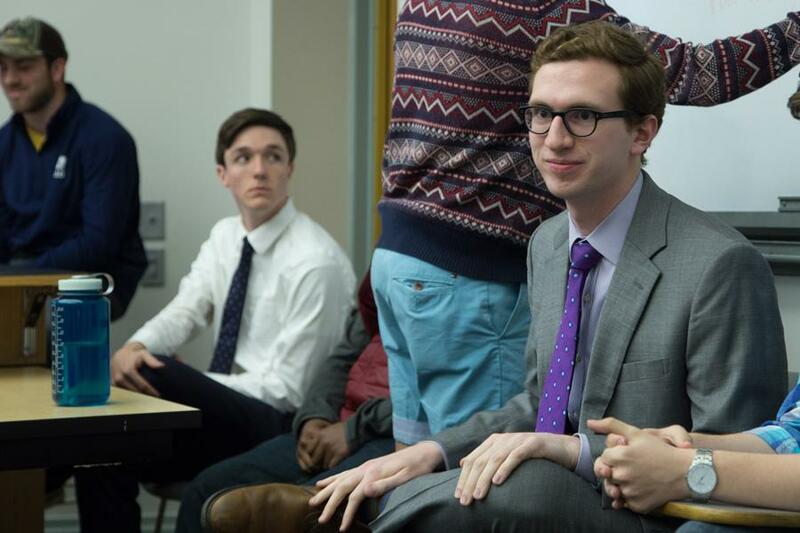 The IFC executive board hosted the event to discuss student concerns and ideas following the banner controversy. Interfraternity Council’s executive board will encourage “values-based recruitment” in addition to implementing an expanded education curriculum starting this fall, the board announced during a forum Monday evening organized in response to the banner controversy earlier this month. The forum drew 12 students to University Hall to discuss and critique IFC’s handling of campus sexual assault. IFC organized the event after criticism of banners it distributed to its chapters for Sexual Assault Awareness Month, which some students found hypocritical and in poor taste. The executive board responded to attendees’ questions and critiques, while also outlining new efforts the board is making. The board plans to encourage chapters to hold recruitment events that help members better understand potential new members’ values, Jacob Swan, a McCormick sophomore and IFC vice president for public relations, told The Daily after the forum. The board also discussed more details of the four-year sexual assault education program it announced earlier this month. The curriculum educates IFC members on social issues, including sexual assault, and will expand to a series of programs aimed at both new and older IFC members. SESP junior Sydney Selix told The Daily she attended the dialogue because she wanted to hear what IFC’s executive board had to say following the banner controversy. Selix said although the event was not well-attended and more conversations like this are needed, she appreciates the board’s “sincere efforts” to address sexual assault on campus. In the future, she said she hopes more IFC members attend similar events. “If you don’t care that your peers are sexually assaulting other women (or) you care but you’re not invested in that, then I urge you to become invested in ensuring that your brothers and your peers are decent human beings and aren’t sexualy assaulting people,” Selix said. Weinberg sophomore Kevin Pu, wellness chair for Delta Chi fraternity, said the dialogue allowed him to listen to the problems some students have with IFC. He said the discussion not only informed him as to what IFC planned to do but made him realize the actions he could take as an individual to change campus culture. Pu also noted IFC’s executive board is largely just “a role model” for its chapters, and individual chapters must take action. IFC president Will Altabef, a Communication junior, said the board will use the information from the dialogue to improve its decisions going forward. Correction: A previous version of this story mischaracterized IFC’s new four-year education curriculum. A series of programs are planned to replace its annual Winter Education Conference. The Daily regrets the error.